BAM! Feels like Summer just hit you over the head when you saw these, right?? Vibrant, big, puffy color--gotta love it! They don't seem too hard to make. 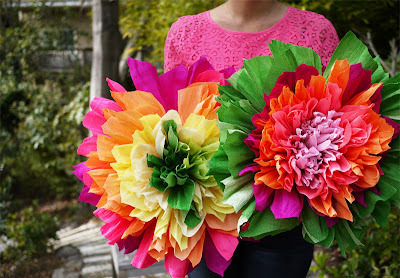 Making these is kind of like making half of a tissue pom. What a great background these would make. Or hang a few on a tree, along the trunk and branches. The colors of these make them perfect for a fiesta. So many possibilities! Find a full picture tutorial at Honestly WTF.